With Johnson Out, Can a New ‘Margaret Thatcher’ Save Britain? The race, however, will be without the colorful Boris Johnson, the tousle-haired former London mayor, who, after falling out with his "Leave" campaign colleague, Justice Minister Michael Gove, unexpectedly decided not to contest the party leadership. Johnson said he doubted he could unify the party split between pro- and anti-EU camps. Johnson’s withdrawal shocked political circles and dismayed Britain’s tabloid journalists, who were counting on him for lively copy. His withdrawal, some Conservatives told VOA, was linked to an extraordinary private email by Gove’s wife, the well-connected journalist Sarah Vines, to her husband. It laid bare the distrust between the top two Leave campaigners and the email leaked to the media helped propel Gove to throw his hat in the ring. In the email, Vines also hinted at the shadowy involvement in the Conservative leadership contest of press baron Rupert Murdoch, who owns a chunk of the British press, and Daily Mail editor Lord Dacre. 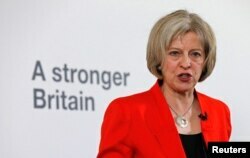 FILE - Britain's Home Secretary Theresa May speaks at a news conference in London, March 23, 2015. With Johnson out, Theresa May, the strong-willed interior minister who reminds many in the Tory party of Margaret Thatcher, is now the favorite to replace Cameron. Just before Johnson’s withdrawal from the race, she presented herself confidently as the “unity candidate” in a feisty, no-nonsense speech that included well-aimed slaps at Johnson. May backed the "Remain" camp in last week’s referendum, but on Thursday reached out to the party’s euro-skeptics. “Brexit means Brexit,” she said, adding, “The campaign was fought, the vote was held, turnout was high and the public gave their verdict. Germany's Chancellor Angela Merkel leaves after the EU Summit in Brussels, Belgium, June 29, 2016. 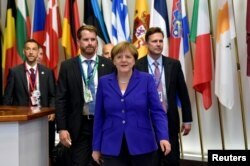 This is adding to an escalation in tension, and in the war of words, between the continent’s leaders and the British; but, as tempers flare, the two sides appear to be talking past each other. “They have hijacked the party and don’t care what happens to it, nor if Labor gets trounced in elections,” he told VOA. “They believe in so-called revolutionary defeatism - electoral defeat doesn’t matter for them as long as they recruit a few more members for their cadre,” he said.